Ahh.. lovely Southern California. It's definitely home sweet home to me. We flew in last night from the crazy hot state of Arizona. As much as I was excited to leave the weather behind, it was just the opposite feeling of leaving the people there. There's one particular teen that I will miss dearly. A small group of us (all women and all who are my very close friends) went to a small city called Sells that's about 1 hour outside of Tucson. The Native Americans that live there are of the Tohono O'odham nation. For the past 10 years or so our church has been sending a team out each summer to do what's called a VBS, Vacation Bible School, where we sing songs, do skits with messages from the Bible at it's core, and crafts. 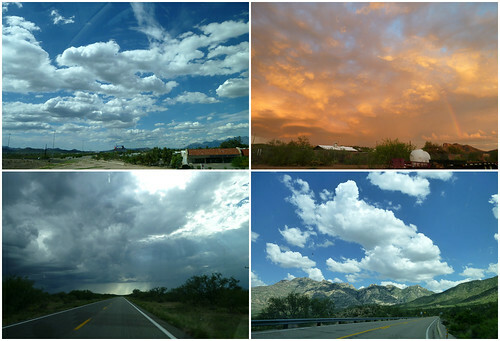 Arizona had some of the most beautiful sunsets and skies I've ever seen. I'm sure California has beautiful clouds but there's too many things off in the horizon that get in the way. The sunset was absolutely gorgeous. Right as it sets all of the orange and reds get reflected onto the clouds and it seriously looks like something out of a painting. One of the ladies, Annette, from the church where we held our VBS took us out to lunch at the town's only shopping center. 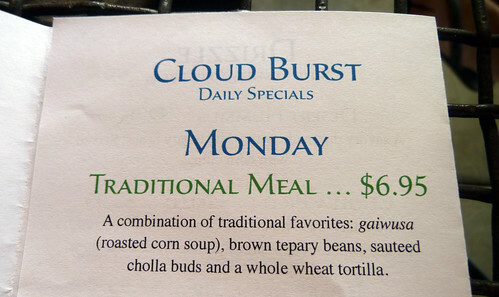 There was a new cafe called the Desert Rain Cafe that opened up that was serving the traditional Tohono O'odham meal. The soup dish reminded me a lot of what Korean's call bori cha, which is barely tea. Sometimes it's made with roasted corn and this soup had pretty much exactly the same flavor. 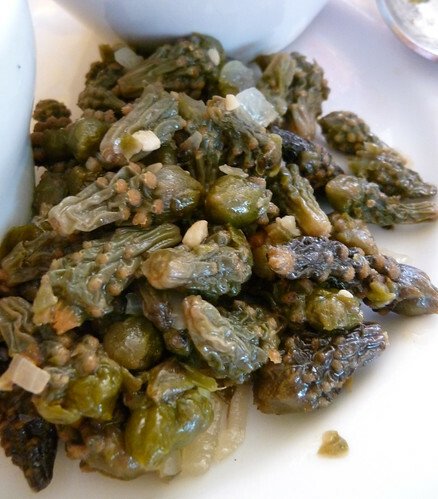 One of the side dishes was cholla buds. Here's a bit more information on the buds and also a some recipes from the Tohono O'odham Community Action website. I had never had anything like it. The taste of it is hard to describe but all in all it was a meal I was really glad to have tried. 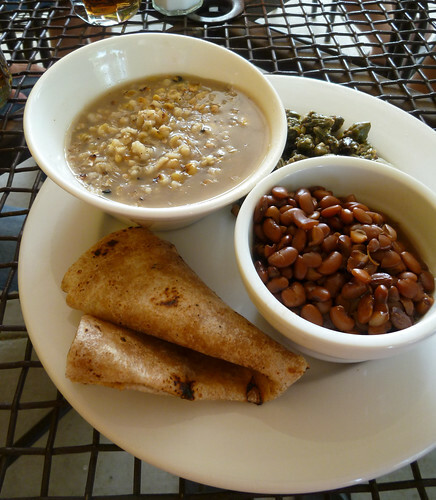 A lot of one's culture can be found in the food and it's always fun to partake in it. those are some beautiful pictures, and i love all that stuff i've never seen before for your lunch! that bit on the cholla buds are really interesting, never seen or heard of them before. looking forward to your next post!